Owner: Highland Distilleries Company Ltd (Edrington Group). Glenglassaugh (pronounced Glen-glas-SOCK) was built between 1873 and 1875 by the Glenglassaugh Distillery Company owned by James Moir, a local wine and spirit tradesman, in partnership with his nephews Alexander and William Morrison, and local coppersmith, Thomas Wilson. 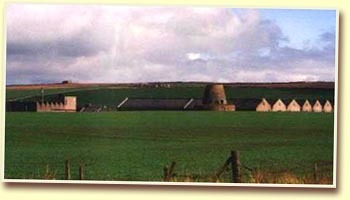 It was built on lands known as “Craig’s Mills” or Craigmills farm after the three mills (two water powered and one wind-powered mill on the site which became the entrance to the distillery) situated there. The distillery cost GBP 10,000 to build. The plan was to supply bottled single malt whisky under the label of “James Moir & Alexander Morrison”. Robertson & Baxter, whisky merchants of Glasgow, Scotland, quickly became the biggest customer for their surplus production and much of the whisky was sold on for blending to William Teacher & Sons, distillers and blenders, Glasgow. Wilson died in 1883 and Moir died in 1887. Between 1887 and 1892, Alexander Morrison had the distillery re-equipped with new stills, washbacks, elevators and barley separators. William Morrison died in 1892, and Alexander sold the distillery to Robertson & Baxter, who then sold it on in that year to the Highland Distilleries Co Ltd for GBP 15,000. Production rose to 110,000 gallons by 1898 but fell back to 28,000 gallons in 1907 and as a result the plant was mothballed in 1908. The distillery was reopened in 1931 but was mothballed again in 1936. It was substantially reconstructed and capacity doubled (through the unusual yet classically utilitarian device of merely doubling the capacity of the existing stills) in between 1957 and 1959 and after the work was completed it was regarded as one of the best designed distilleries in Scotland, although you’d wonder what the traditionalists would’ve thought as it was lore that you didn’t muck around with the design of your stills, but maybe the size and configuration of your stills is not considered significant when you’re in the bulk malt for blending market. It is pointless to speculate whether the change in the size of the stills impacted on the profile of the final spirit as you’d need to have a stack of empirical evidence to hold your ground on any side of the argument. The history of the distillery has been characterised by relatively short periods of activity interspersed with rather lengthy silent periods. In the period between 1960 and 1986 it produced malts for the blending market. Like a lot of distilleries it was a victim of the major recession in the scotch whisky industry which led to the demise (either temporarily or more often permanently) of over 18 distilleries in the period 1983 to 1986. Most recently it has been silent since 1986 with only a very small period of activity in 1998 and the prevailing sentiment is that it will remain silent, with limited prospects for it opening again. It was almost exclusively producing for the blending market, being a constituent in such well known blends as Famous Grouse, Laing’s and Cutty Sark. Many references cite Laing’s as a blend yet there is no blend of that exact name (at least not one that comes up on a google search) so maybe they mean Laing Brothers who are blenders or Langs which is a blend usually associated with Glengoyne. While it has been highly regarded by blenders, none of the owners had particular faith in its prospects as a single malt. The only official bottlings extant (both from Highland Distillers) have been a Family Silver series from 1973, released in 1998 and a distillery release which didn’t have an age statement in some markets and was a 12yo in others, which was available in some markets in the late 1970’s and in others up to the mid 1980’s. I think Sukindher Singh has tracked down some stocks of the 12yo, but expect to pay collector’s prices. Both distillery releases are now extremely rare and it’s a shame that it looks like Glenglassaugh doesn’t have a future as I’ve found the expressions I’ve tasted clean, pleasant with an attractive lightly toasted creamed honey note. Other bottlings have been available from independent bottlers, mainly from Gordon & MacPhail but also from William Cadenhead and Scotts Selection and Royal Mile Whiskies. The Gordon & MacPhail bottlings have been more availaible in Australia, but I can’t comment on the rest of the world. Based on the bottlings I’ve sampled, there is an identifiable and moderately distinctive distillery style. The official bottlings are almost certainly from first fill and refill bourbon wood and have a distinctive fresh linen and fresh cream top note, which I’m convinced is the flax that gets a mention in Michael Jackson’s tasting notes. They also have a slight coastal character, which tends to show up in an aroma of fresh celery and a very faint stock note. In the palate, they have a little forward gristy malt, negligible to zero peat and a faint hint of fresh cream. Not wishing to compete or compare with Wishart or Murray, but if you’re looking for malts that have a somewhat similar profile then I’d suggest that one could start any exploration with Glen Elgin, Glen Moray and Glengoyne (all from 100% bourbon wood). Three coastal disilleries that have similarities (only from bourbon or refill bourbon and at fairly young ages) are Glen Scotia, Bruichladdich and the occasional expression from Glenmorangie. Sources: Malt Whisky Yearbook 2006, The Pocket Whisky Book by Charles MacLean (1993), Michael Jackson’s Malt Whisky Companion 4th Edition (2000), The Malt Whisky File, Lamont & Tucek (1995), Scotland and its Whiskies – Prof RJS MacDowell (Second Edition 1971): Moss, Michael, Quality in a Century of Uncertainty – A Hundred Years of Highland Distillers Co Ltd, (unpublished manuscript, UGD 358/1/1/11).